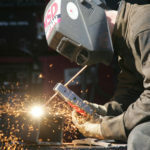 Explosive Welding is a solid state welding process i.e. this process does not include molten state during welding the different parts of metal which have to be welded. This method was developed in the decades after the World War II. Dupont applied for the patent of this welding process in 1962 which was granted on June 23, 1964. It is the process in which two or more dissimilar metals are joined by accelerating one part at high speed by the use of chemical explosions through controlled detonations or explosion. This welding is considered as a cold welding process which allows metal to be joined without losing their pre-bonded properties. 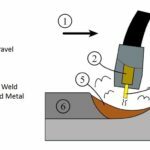 This process does not require any filler material to weld metals. This process is too advantageous like it does not affect the properties of the metal and does not melt etc. Explosive welding is basically based on metallurgical bonding that is the bonds between dissimilar metals. In this process controlled explosions are done which generates a high quantity of pressure which results in deformation of metal work piece plastically, this deformation results in metallurgical bonding between the metal parts. These detonations occur for very short period of time due to which neither the metal gets damaged nor the properties of the metal get altered. The metallurgical joints or bonds are stronger than the original metal bonds. Base plate (Backer): This plate remains stationary it provides support and it helps in reducing or minimizing the damage at the time of detonation. Flyer plate (Clad): This plate gets welded on the base plate. It is situated at the parallel of the base plate or at the angle at which the base plate is inclined. 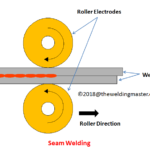 Standoff distance: It is very important factor considered for explosive welding. It is the distance between the flyer plate and the base plate. Generally standoff distance is taken as double thickness of it. Buffer plate: This plate is used to reduce the effect of explosion on upper surface of flyer plate. This protects the flyer plate from any damage due to explosion. Explosives: they are place on the buffer plate or directly on the clad. It produces explosion for the welding. In this method of welding, thick and large plates are used and joined .There is standoff distance between the plates. In this process base plate is fixed and flyer plate is inclined at an angle to the base plate. This setup is used to join small and thin plates. Firstly the metal parts or plates should be cleaned thoroughly; no rust should remain on them which may lead to some problem in welding process. If it is parallel explosive welding then the base plate and flyer plate will be parallel to each other as the name suggests. And if it is oblique explosive welding then the base plate have to be fixed on anvil and flyer plate will make angle according to the base plate. The prepared explosives are placed in box of same size as of surface to be welded which is placed over the buffer plate which protects the flyer plate below it. Now the explosives are ignited. On igniting the explosives, a high pressure is created which deforms the plates. These plates get plasticized and forms metallurgical bonds which are stronger than the original metal bonds. 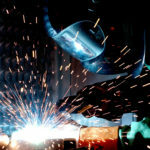 It is able to weld many dissimilar metals, normally the metals which are not able to be welded by any other method. This process is very simple; no high skills are required to operate it. Extremely large surfaces can be bonded or welded. There is no effect on parent properties of the metal after welding, they are unchanged. Very small quantity of explosives is used in explosive welding process. 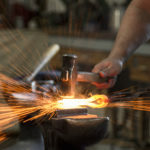 No part of the work piece gets heated like in other methods of welding. In this process no molten state of metal is included; metal is only plasticized to join other part. It can weld only ductile metal with high toughness. The geometries welded are limited to simple designs– flat, cylindrical, conical. Higher safety precautions involved due to explosives used. It is used to weld large structure sheets of aluminium to stainless steel. Welds clad sheet with steel in a heat exchanger. 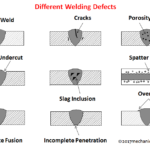 Join dissimilar metals which cannot be welded by other welding process. Joining of pipes and tubes. Joining of dissimilar metals can be done for eg – Aluminium to steel, Cu to stainless steel, Titanium alloys to Cr – Ni steel, Tungsten to Steel, etc.